During the 2019 Bauma fair, Palazzani Industries S.p.A. presented the XTJ 37+, a new model entering the wide range of Palazzani’s Spider Lifts “Plus Series”. The XTJ 37+ features a classic Palazzani’s telescopic boom with telescopic jib, featuring 37 m of maximum working height, an exceptional outreach of 16 m, 5,5 m in negative, in only 2.6 m of set-up. Designed to be extremely compact, 7.8 m long, 1.2 m wide and only 2.0 m high, the new Spider is going to amaze for its excellent performances and ease of use, thanks to the implementation of the most advanced technologies. The wide dimensions of the basket offers maximum comfort for the operator. 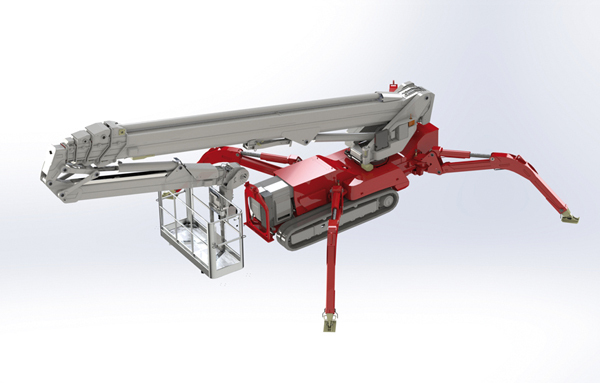 Equipped with radio control on the ground, air/water pipe on the arm and intercom in standard configuration, the XTJ 37+ has all various optional items already present on the other Palazzani models, including the hydraulic winch of 500 kg that makes the machine even more versatile, transforming it into a Spider Crane. The new Spider XTJ 37+ fits into the existing range of the Palazzani’s Spider Platforms, from 17 to 52 m of height, and will be available in both “crawler” and “wheel” versions as well as with diesel+AC, AC+DC, and diesel+DC power options. Plus means more speed: the CAN-bus system increases the speed of the machine during aerial work. Plus means more precision: the high precision of aerial movements allows delicate operations to be carried out in total safety. Plus means more efficiency: extremely fluid movements bring reduces energy consumption and optimize working times. Plus means more safety: the Easy Drive feature makes the loading operations easier. The innovative transfer system gets the 2 crawlers rotating at the same speed, avoiding unintended steering. Plus means more comfort: with the “Return to Home” function, the machine automatically switches from work position to transport position. Plus means more interconnection: with the PALConnect kit, the platform can be iconnected with other softwares, and the main functions of the machine can be controlled and checked remotely.